Thanks to the magic of worldwide time zones, Apple Watch users in Australia have had the new wearable on their wrists well before the rest of us. Rather than an unboxing, Australian site FoneFox posted a detailed water test instead. First of all: under no circumstances try this yourself. Officially, the Apple Watch is only "splash and water resistant", which means it's fine in the rain or the shower but not guaranteed to survive anything more than that. 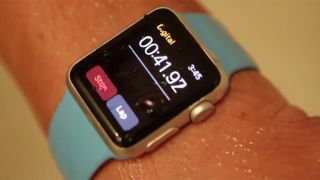 FoneFox submerged the Apple Watch in a bucket of water for five minutes before taking it for a 15-minute swim... and it functioned perfectly fine afterwards. We wouldn't advise wearing your Apple Watch down to the swimming baths and nor would Apple, but it's reassuring to know that your wearable should survive a drop into the washing up if it happens to slip off your wrist. It's been a day filled with Apple Watch unboxing videos and detailed teardowns of the new device - eager punters have been waiting since September to get their hands on the new device, after all. As for working out how well the Apple Watch will do in the long-term, we'll have to wait for a future Apple earnings call to find out. Our full review is going to be online soon; in the meantime, here are our first hands-on impressions.